There's no doubt that the 2019 Keystone Cougar Half Ton 32RLI is one fantastic Travel Trailer! If you want to own it at a price that will astonish you, then come into TerryTown RV today! We're located in beautiful Grand Rapids, Michigan and we've been selling RVs for over four decades - all at huge discounts! We have acres of new travel trailers, 5th wheels, toy haulers, and more! You'll save thousands on your dream RV and get great financing too! We're conveniently located at 7145 Division Ave S Grand Rapids Michigan 49548! Or give us a call at 616-455-5590. With our worldwide fast, reliable delivery, you'll be in your perfect rig before you know it! Hit the road with your whole family or your friends in this Travel Trailer. It's easily towable with a hitch weight of 1165 lbs! This rig has a GVWR of 10500 lbs. and is easy to set up! Twice the fun with outdoor comfort under the 12' 0" patio awning to shade you from the summer sun! 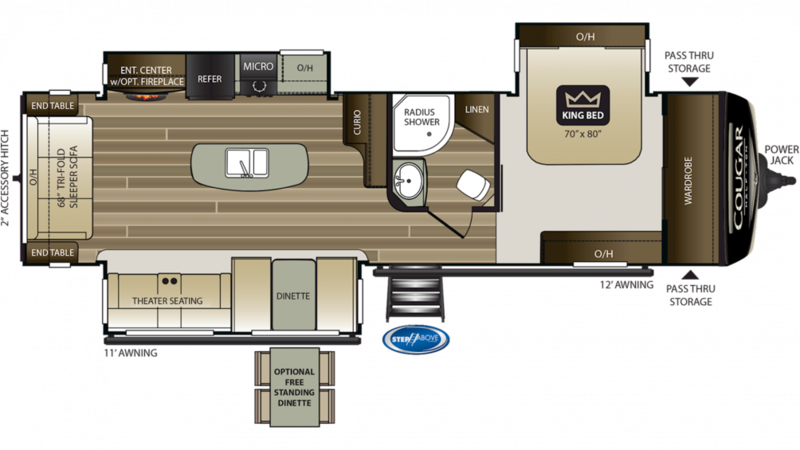 By expanding out the 3 slides, you'll enjoy increased spaciousness inside this 8' 0" wide, 36' 6" long RV! With a height of 11' 4", you won't have to worry about constantly hitting your head! The interior stays nice and temperature controlled with the 35000 BTU furnace and the 15000 BTU a/c! The living area stay nice and temperature controlled with the 35000 BTU furnace and the 15000 BTU a/c. This Travel Trailer has a length of 36' 6", a width of 8' 0", and a height of 11' 4". There are 3 slides that provide extra walking space inside! Even if your family is as large as 6 people, there's enough sleeping space for everyone! You'll be extra comfortable at night in the master bedroom, with its cozy King bed! What better way to satisfy your cravings than with a hearty meal cooked in the kitchen! You can store an abundance of fresh food in the 8.00 cu. ft. refrigerator, and then whip up a hot dish with the 3 burner range cooktop! You'll have enough refreshing, clean water for your family's needs with the massive 60 gallon freshwater tank! No more onerous treks to the cold, damp, often messy campground public restrooms, thanks to the beautiful bathroom in the Keystone Cougar Half Ton 32RLI! It comes complete with a sink, shower, and a Foot Flush toilet! Enjoy leisurely showers anytime, hot as you please with the 60 gallon freshwater tank and 60 lbs. of LP tank capacity! Used and waste water are stored in the 60 gallon gray water tank and 30 gallon black water tank, respectively!